Cadillac President Johan de Nysschen with the Escala concept at the 2017 Geneva auto show. Cadillac, on average, plans to release a new vehicle every six months by 2022. NEW YORK -- Cadillac will realign its product portfolio and get its business operations in line before releasing a "halo vehicle," according to brand President Johan de Nysschen. That means consumers and dealers will have to wait until after 2022 for such a vehicle -- following the completion of Cadillac's previously announced product shift to three cars, three crossovers and the next-generation Escalade through 2021. Those products, according to de Nysschen, will better position Cadillac and its dealers for future success and products, including a halo vehicle -- not necessarily a car -- that could include all-electric and internal combustion variants. Once Cadillac fills in the white spaces in its portfolio, the brand "can, candidly, generate some growth, generate some revenue, put volume through our dealer organization so they can also invest in the elevation of the brand, all those logical things," de Nysschen told Automotive News at the auto show here. 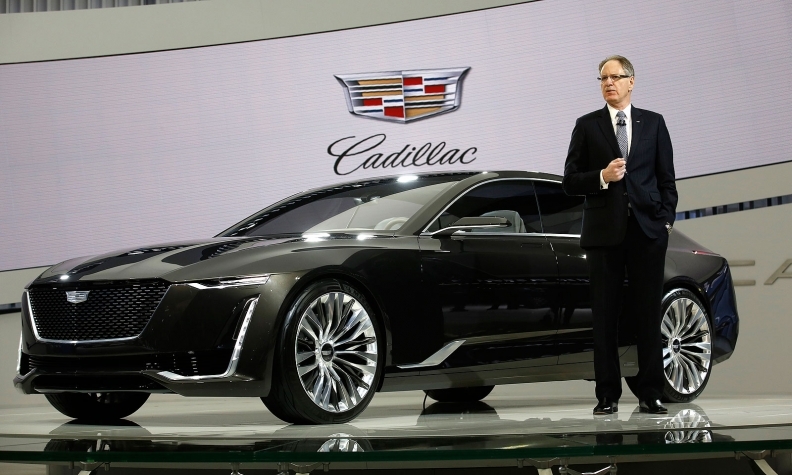 Cadillac, on average, plans to release a new vehicle every six months by 2022. It started Tuesday with the reveal of the new XT4 compact crossover. That will be followed by the unveiling of a large crossover -- either XT6 or XT7 -- possibly late this year and then a replacement for the ATS compact sedan and potentially the CTS midsize sedan late next year. Through 2021, de Nysschen said the brand will focus on a vehicle portfolio powered by internal combustion engines, including Cadillac-exclusive V-8 and V-6 offerings. Following that time frame, Cadillac will begin releasing electrified vehicles as part of General Motors' plan of 20 new all-electric or fuel cell vehicles by 2023. De Nysschen reconfirmed Cadillac is slated to receive a "disproportionate share" of those electrified vehicles. 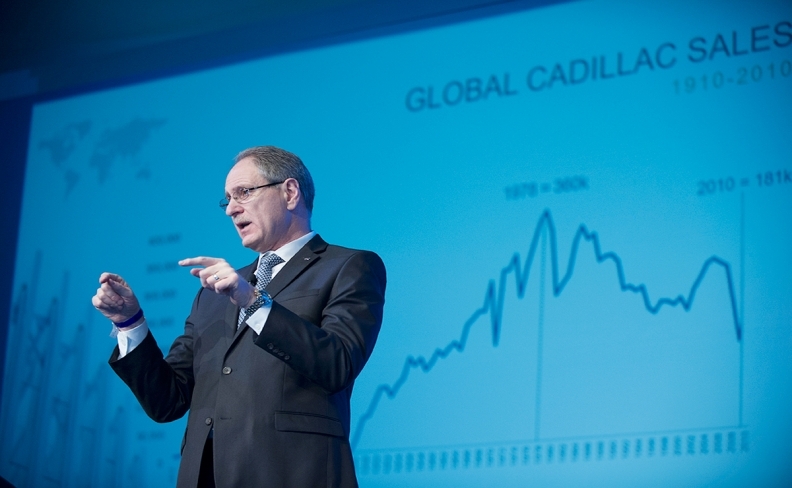 Cadillac President Johan de Nysschen said the brand will focus through 2021 on a vehicle portfolio powered by internal combustion engines, including Cadillac-exclusive V-8 and V-6 offerings. "Since these new technologies are pricey, it really begins to make a lot of common sense, not in all cases, to roll out some of them in Cadillac first," he said. "We therefore see it as a great opportunity for Cadillac to take the lead from GM with rolling out these things. Not only for the company and economically commercializing these new technologies, but also for the brand elevation it will give to Cadillac." The American brand, according to de Nysschen, sees electrification as an opportunity and "inflection point" to gain ground against German luxury brands such as Audi, BMW and Mercedes-Benz that have dominated the global luxury market for decades. "Over many decades, they've built a reputation for excellent execution and great engineering. When it gets to electrification and a whole new set of considerations drive the buying decision, the fact that you made fantastic engines for three decades counts zip," he said. The Germans aren't resting on their laurels, though. Each has announced aggressive electrification plans, including Audi planning 25 percent of its U.S. lineup to be EVs by 2025 and BMW announcing an onslaught of 25 electrified vehicles, including 12 EVs, during that same time frame. M-B has committed to launching 10 all-electric vehicles by 2022 -- around when Cadillac will begin shifting to the technology. As Cadillac ramps up its EV offerings, de Nysschen said the brand will continue to offer vehicles with internal combustion engines, in some cases having "multiple entries" in the same segment with different powertrains. "These new technologies are fascinating and disruptive but at the moment not yet all commercially feasible. After all, go look at how much money Tesla has made, to illustrate the point," he said, later adding that the internal combustion engine is "going to be around for a while."